Baoguo Temple (Chinese: 保国寺; Hanyu Pinyin: Bǎoguósì) is a Mahayana Buddhist temple located in Jiangbei district, 15km north of Ningbo, in Zhejiang, China. It is famous as the oldest surviving wooden structure in southern China, as the main hall of the present temple dates back to 1013 in the Northern Song dynasty. 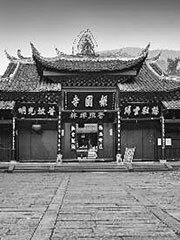 The temple was originally named Lingshan Temple (灵山寺), but was later renamed to Baoguo Temple in 880, during the Tang. The main hall was rebuilt in 1013, during the Northern Song dynasty, and is one of the oldest and most well preserved wooden constructions in China. The temple also contains columns of the Tang dynasty, a hall dating from the Ming, and two halls and towers of the Qing. The temple can be accessed by bus 232 from Ningbo city. The ride takes approximately 35 minutes. Standard tickets are 12 yuan per person. Guides are available for an additional fee.